Botox Cosmetic is a simple, nonsurgical, physician-administered treatment that can temporarily smooth moderate to severe frown lines between the brows in people from 18 to 65 years of age. Radiesse is a safe, FDA-approved dermal filler correcting nasal labial folds and wrinkles around the nose and mouth. 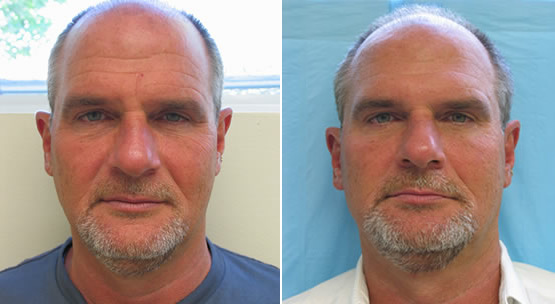 This simple, safe and minimally invasive procedure rebuilds the skin’s foundation and restores a natural youthful look. Sculptra restores and corrects the lines caused from lipoatrophy or aging, resulting in a fuller face and more youthful appearance. Restylane is a safe and natural dermal filler that restores volume and fullness to the lips for a more full rounded appearance. In some cases, a combination of procedures can breathe new life into aging skin. Here is a fine example of the layering of Juvederm, Radiesse, Restylane and Botox. Here is an amazing transformation using a combination of Botox, Radiesse and Restylane to reduce age lines and creases in the skin. Juvederm was used to increase volume in the lips.